Living a life that sees you jumping out of a plane a couple of times a day is one that many would be envious of, while others would be terrified, but that’s exactly the kind of life that Caroline Cassidy lives. Based in Walsh Island, Co. Offaly, the proud mum of two works as an administrator for the Irish Parachute Club while volunteers as a skydiving instructor as well. So how do you go from a regular day-to-day life to deciding you want to jump out of planes? 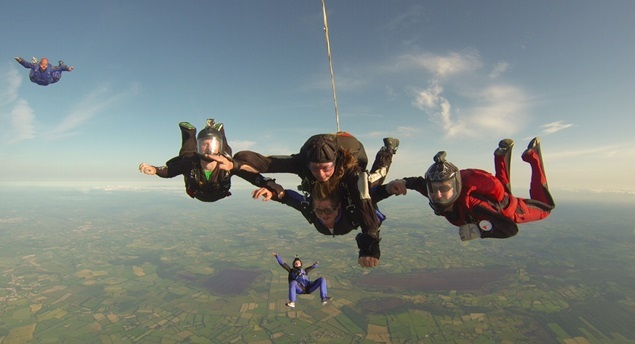 Here, Caroline – or Cas Cas as she is known to friends – the only female skydiving instructor in Ireland, explains. 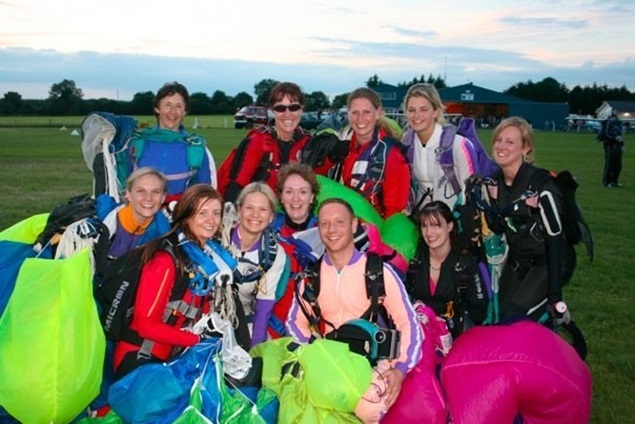 “I did my first skydive in 1992, a sponsored skydive for the Irish Cancer Society,” she began. “The reason I did the fundraiser was because my uncle-in-law had died at the age of 36, leaving behind seven young kids and I just wanted to do something in memory of him. “I was never in a plane before, so you can just imagine how scared I was! My parents drove me over to the Irish Parachute Club but I wouldn’t let them stay because I was afraid that I would chicken out,” she added with a laugh. “The people I met over there were so welcoming and friendly, it took a couple of attempts of driving over and waiting for the weather but I eventually got my jump and that was it – I was hooked – and I signed up for my Static Line training the same week. “Back then at the same time, there was another girl jumping at the same time as me who was also called Caroline and they kept mixing us up on the waiting list, so they shortened my name to Cas Cas for that and it just stuck! “The club is great, you meet so many different nationalities and people from all walks of life who all come together in the same place to learn the one thing and it makes us equal. The best thing about skydiving is that it is one of those sports that is gender friendly and both genders can excel at it. “You can pick a discipline that you want to do, there is RW (relative work) and that is where groups come together and make a formation in the sky and I love the challenge. I have been on every Irish Record starting with 15 way 1998, 16 way 2004, 28 way 2006 and 30 way 2007, but our biggest record was in 2008, a 51 way. “I was picked for that challenge, but I had to pull out because of family commitments and at the end of the day, my girls are more important to me than any jump. “From there, I helped to organise the Irish Women’s record in 2008. We started with a 10 way but we got to 13 way, and it was great to get so many ladies in the air. “Now, I am an USPA (United States Parachute Association) AFF (Accelerated Free Fall) instructor. I am also a Static Line instructor, free fall coach, progression coach and I also do display jumps and I love every second of it. “The Irish Parachute Club is the only centre in Ireland to offer both of these programmes for people to learn how to skydive and I really love working with first time students as their reaction after their first jump is great and it’s great that I can pass on the knowledge that was given to me by my instructors to the people that I am training now. “I am the only female instructor in Ireland and I have been helped to get my ratings with the Irish Parachute Club and all of my mentors throughout the years,” she continued. “That makes it sound like I’m ancient, but skydiving keeps us young and I do try to keep fit! “The more fit you are the more it helps you when you are jumping. I love training people and that is what keeps me motivated, AFF is great because you are in free fall with someone who has never jumped before and communicating with them through hand signals to help with their body position. 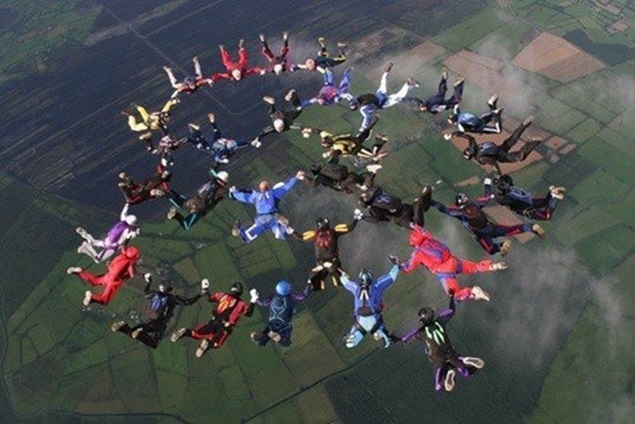 “Skydiving in Ireland can be a challenge in itself because of our weather but we have a great community of skydivers and it’s great to see so many of the people that I have helped train go on and achieve bigger and better things. “Over the years, I have taken a couple of breaks from skydiving, but I always seem to go back to the sport I love. When my girls were very little it was a challenge, but my own mum was great and would look after the girls for me so that I could go and do a few jumps. When my mum got sick at the end of 2008, I also stopped for a while. I sadly lost my Mum in 2009 from cancer and it just showed me how short life can be and to enjoy each day as it comes. 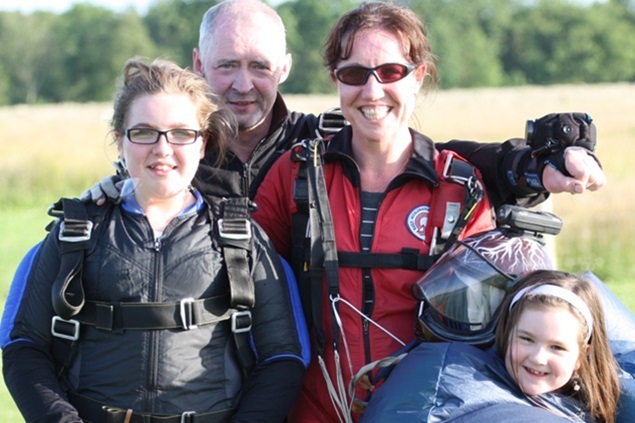 “As the girls got bigger, I just brought them with me and they have grown up around skydiving and they don’t think anything of the fact that their mum jumps out of a plane. “I was more nervous than she was because, at the end of the day, skydiving is classed as a dangerous sport even though the gear that we jump is checked and has every safety feature on them to try and make it as safe as possible. But it was a special day. “At the moment, my days are always busy especially with two girls who have other activities going on and working. I would be lost without my two closest friends Laura and Anya, we all help each other out a lot. “My advice for anyone thinking of skydiving? I would highly recommend anyone to do a jump: I once trained an 89-year-old man to do a static line jump and he loved it! “Skydiving is great and you can meet loads of new people and travel all over the world with your passion. I started with a sponsored skydive and I would say that if you have a cause in mind or if you just want to give it a go, then GO FOR IT – I guarantee you won’t regret it. PreviousPrevious post:Our New Website Is Looking GoodNextNext post:Bank Holiday Opening Times.